University City District works year-round to change places and change lives. Here are a few of the ways we did so in 2018. Please use the before and after comparison slider below and throughout the site. After years of effort, we completed our newest public space, Trolley Portal Gardens. 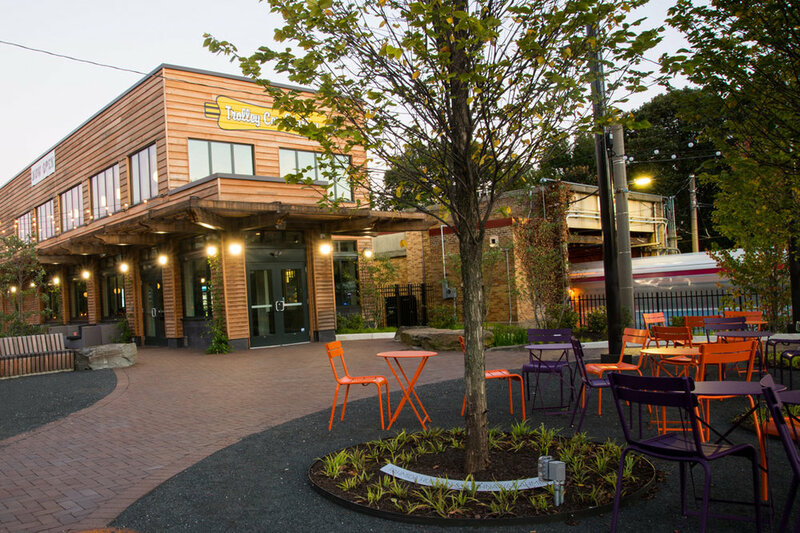 The $4.5 million public-private project transformed a utilitarian transit hub into a vibrant space that features lush landscaping, seating options, and the new Trolley Car Station restaurant. The project serves as the new eastern anchor of the Baltimore Avenue business corridor, and we invite the community to come and relax, linger, eat, play, and catch a trolley! Read more about it from The Inquirer and The Philadelphia Citizen. Before walking in the door of our job training program, West Philadelphia Skills Initiative participants had spent an average of 53 weeks without a job. Last year, 91% of our graduates connected to life-changing employment opportunities, and today they possess the skills and confidence needed to thrive on the job. In 2018, we developed projects with the five civic associations on our board to improve our shared community. Like this long empty storefront that now tells the story of Cedar Park, the projects speak to the rich history and civic engagement of our community. From placemaking interventions to signage featuring notable residents from the past, you can read about all 5 projects here. Our Green City Works landscaping social venture cultivates beautiful public spaces across the district and city, and – as a social venture – it also transforms the lives of crew members, including Xia Frazier. In three years, Xia went from unemployment to serving as the site supervisor for CHOP’s Roberts Center, one of our largest clients. Learn more about Xia in the video above. The Hickman Temple AME church at 50th and Baltimore Ave faced a crisis when harsh winter weather caused a section of the roof to detach from the wall, forcing the congregation out of their sanctuary. The church’s leadership came together with UCD’s Project Rehab and a group of neighbors to develop a plan to save the historic building from the wrecking ball, ensuring the future of a vital community anchor. Read more on the story from Plan Philly. When Mason Wartman, owner of the successful $1 slice pizza shop Rosa’s Fresh Pizza in Center City, sought a second location for his business, UCD’s Small Business Services lent a hand. We helped find a location on 40th Street, secure nearly $120,000 in funds, and serve as a liaison to City agencies. An empty storefront became a bustling business that is already spurring more business growth along the corridor. Read more about this project from The Inquirer. Since UCD’s inception our safety ambassadors and public space maintenance professionals have worked year-round to clean, maintain, and patrol more than 160 blocks. By keeping the community clear of graffiti and trash, UCD’s cleaning crews ensure that the neighborhood is a dynamic place for residents, students, employers, and businesses, while our ambassadors are on the streets providing walking escorts and vehicle jumpstarts to create a safe and welcoming environment. Where once we had parking spots, we now have The Porch at 30th Street Station, our flagship public space – and this year marked the first full season of The Pub at the Porch, a bright turquoise beer garden meant to activate the space in the evening. After seven years in operation, The Porch continues to serve as a testing ground for new ideas, a gathering spot for workers and commuters, and the catalyst for public space development in the surrounding area. In the span of just a few hours, UCD’s Baltimore Avenue Dollar Stroll transforms this commercial corridor into a street festival that entices thousands of people from across Philadelphia to try $1 deals from local businesses and vendors. Our signature events like University City Dining Days, Movies in Clark Park, and the Summer Series bring life, vibrancy, and commerce to our community. 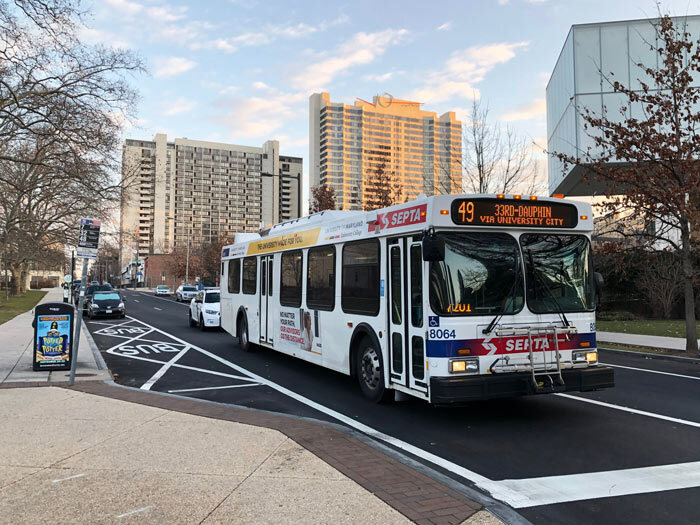 In 2018 we formed a Transportation Management Association (TMA) to take on transit issues impacting our neighborhood, from highway on-ramps to congestion to new bike lanes. 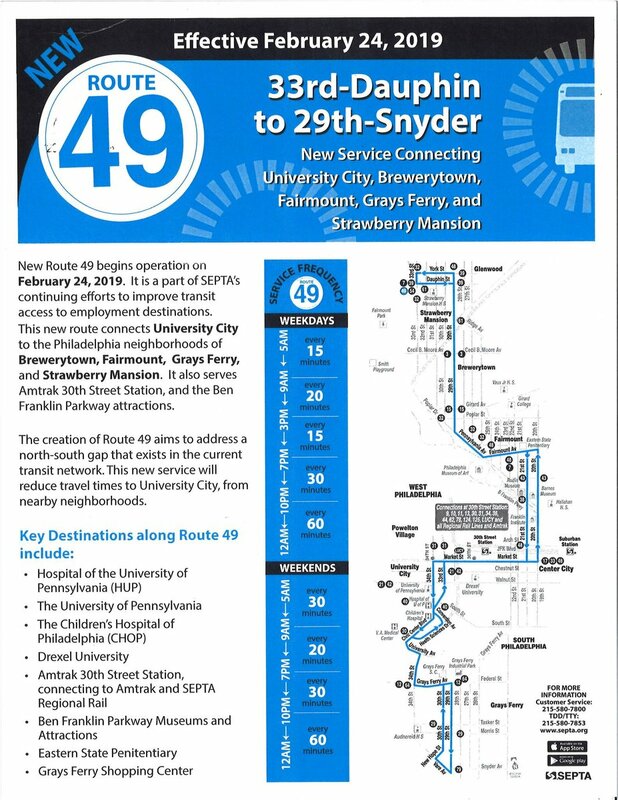 In February 2019 the new 49 bus route, developed with input from UCD, will debut to connect underserved neighborhoods to University City jobs. See our impact around the neighborhood! Our FY18 Financial Results are available here. Thank you to our funders and donors for making our work possible. We look forward to working with our partners to continue improving our community in 2019!